• Ascher, Marcia, and Robert Ascher. Mathematics of the Incas: Code of the Quipu. (Mineola, NY: Dover; originally published by Univ. of Michigan Press, 1981) 1997. The authors propose a solution to the mystery that has puzzled scholars of the Inkan tradition. Quipus are knotted cords by means of which the Inkans kept their records and conveyed messages. But the knowledge of how they used this code of knots has been lost. • Bauer, Brian S. The Sacred Landscape of the Inca: The Cusco Ceque System. Univ. of Texas Press, 1998. hardcover. "A major contribution to Andean studies. . . . Bauer not only provides a grand synthesis of what is known about the ceque system, but also provides new description, fieldwork, and interpretation. The book will have a wide audience." -Clark L. Erickson, Associate Professor of Anthropology, University of Pennsylvania. From the book's jacket: "The ceque system of Cusco, the ancient capital of the Inca empire, was perhaps the most complex indigenous ritual system in the pre-Columbian Americas. From a center known as the Coricancha (Golden Enclosure) or the Temple of the Sun, a system of 328 huacas (shrines) arranged along 42 ceques (lines) radiated out toward the mountains surrounding the city. This elaborate network, maintained by ayllus (kin groups) that made offerings to the shrines in their area, organized the city both temporally and spiritually. 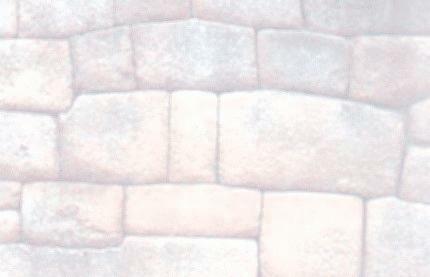 "From 1990 to 1995, Brian Bauer directed a major project to document the ceque system of Cusco. In this book, he synthesizes extensive archaeological survey work with archival research into the Inca social groups of the Cusco region, their land holdings, and the positions of the shrines to offer a comprehensive, empirical description of the ceque system. Moving well beyond previous interpretations, Bauer constructs a convincing model of the system's physical form and its relation to the social, political, and territorial organization of Cusco." Pricey, but amazon.com is selling it for 'only' $50.00 US. • Brenuil, compiler, Peruvian Dishes: Traditional Dishes Simplified (Platos Peruanos: Platos Tradicionales Simplificados) (Lima, Peru: Librerias A. B. C. S. A.) 2nd ed. 1980. Text in both Spanish (left page) and English (facing page). This is a straightforward, no frills cookbook. Color photos of some of the dishes; vocabulary in Spanish-English and English-Spanish; table of equivalent measurements and two indices. However, no English substitutions for the foodstuffs and condiments, spices and herbs not normally available in English-speaking countries are given. For a much more English-user-friendly Andean cookbook, see the one by Copeland Marks, below. • Brown, Jeff L., "Rediscovering the Lost City." Civil Engineering, Vol 71:1, Jan, 2001. Long and well-written, this article is definitely worth reading, but I can't find it online now in 2012. Abstract: "Since 1994, Kenneth R.Wright, P.E., of Wright Water Engineers, in Denver, has been studying evidence of civil engineering at the ruins of Machu Picchu-an ancient Inca city in the Andes Mountains in Peru. The Inca had to apply their knowledge of engineering to solve problems of water supply, foundations, and drainage. They found a spring uphill from the site and built a canal to carry the water into the city. The canal ends in a series of 16 fountains that make the water accessible. Wright studied the hydrology of the area and found no basis for the theory that a water shortage caused the Inca to abandon Machu Picchu. The Inca also built a complex drainage infrastructure consisting of channels and outlets that are integrated into the architecture; a main drain to collect runoff from the channels and carry it away from the city; and a subsurface drainage system in the agricultural terraces and urban plazas. Wright's analysis also included building foundations and stonework." However Amazon.com has 3 books (expensive) about the water engineering in this ancient city, and a hydrological map of Machu Picchu made by Wright Water Engineers. • Cobo, Father Bernabe. History of the Inca Empire: an Account of the Indians' Customs and Their Origin Together with a Treatise on Incan legends, History, and Social Institutions. Translated and edited by Roland Hamilton. (Austin: Univ. of Texas Press) 1979 (pb 6th printing, 1998). Father Cobo spent many years in Peru collecting legends and accounts of Inkan history. Since he did this work about a hundred years after the Spanish invasion, the tales he recorded are from previous accounts, many of which have since been lost, and hearsay evidence presented by the Andean indigenous peoples of his time. Also, Cobo filtered this through his Catholic religious viewpoint and the European penchant for misinterpreting other quite different cultures. Scholars have since found that much of his accounts may be quite inaccurate. • Cumes, Carol, and Rómulo Lizárraga Valencia. Journey to Machu Picchu: Spiritual Wisdom from the Andes. (St. Paul, MN: Llewellyn) 1999, 2nd ed., revised and expanded. Cumes has lived and traveled extensively in the Andea with the Quechua people and established a spiritual retreat center, Willka T'iki, near Urubamba in the Sacred Valley near Cuzco. Lizárraga Valencia is a Quechua from the Machu Picchu region and leads excusions and lectures. In their book, they explain Andean spirituality and cosmology, often reporting about various topics in the words of the Quechua healers, herbalists and shamans they interviewed. Packed with information and interesting stories, this is a must-read for those interested in the Andean spirituality and way of life. See also the link to Cumes' spiritual retreat and travel company, Magical Journey Sacred Tours to Peru, on page 15. • Danbury, Richard. The Inca Trail: Cuzco & Machu Picchu. (Surrey, UK: Trailblazer) 1999. One of the best travel guides I've seen. Loaded with information about Machu Picchu, Cuzco, the Inca Trail and the sacred places along it, Lima and the history of the Incas, maps of many of the ruins, including Machu Picchu, and street plans of Lima and Cuzco, lots of color photographs, "green hiking," a Spanish-Quechua appendix, a glossary of Quechua and Spanish terms, and more. • Fernández, Ricardo Valderrama, and Carmen Escalante Gutiérrez, original editors. Andean Lives: Gregorio Condori Mamani and Asunta Quispe Huamán. [Translated from the Quechua and with Annotations and Revised Glossary, by Paul H. Gelles and Gabriela Martínez Escobar] (Austin: Univ. of Texas Press) 1996. Here are presented first-hand narratives of the personal lives and struggles of an Andean indigenous man and woman who lived and worked in Peru during the first half of this century. Many of the prejudices and hardships they encountered are still experienced by Andean indigenous peoples today. These are not pretty stories. These two small booklets are the first in a series Garcia, a clinical psychologist and educator, plans to write for children. She tells the stories in English and Spanish on the same page with marvelous drawings by Enrico Piñas on the facing page. Review questions are at the back of the books. Garcia traces her ancestry back to the Inkas. Although she has lived and worked in the USA for many years, it's obvious from talking with this very vivacious woman that her heart is with her people. She is active in "promoting Incan and Mayan cultures through exhibits in museums, libraries, schools, universities, and consulate offices." Amazon.com carries one if these books by Della Garcia. • Glass-Coffin, Bonnie. The Gift of Life: Female Spirituality and Healing in Northern Peru. (Albuquerque, NM: Univ. of New Mexico Press) 1998. A wonderful story of a North American woman anthropologist's adventure and growth, both as a scholar and a spiritually oriented person, as she attempted to understand the basis of the healing powers of several indigenous curanderas, without imposing her own cultural bias. A tough task in the world of academia, but she succeeded admirably. • Jenkins, Elizabeth B. Initiation: a Woman's Spiritual Adventure in the Heart of the Andes. (NY: G.P. Putnam's Sons) 1997. This book gave me the inspiration and information I needed to connect with this wonderful, ancient spiritual tradition. Even if you never travel to the Andes, you'll get a very good education about how the Andean priest/shamans view our world as a mixture of energies existing on three levels and how they work with these energies. The middle level is the only one which most people in the dominant European-oriented cultures pay any attention to, and this without an understanding of the underlying energies. Website. Jenkins explains basic beliefs and practices of the Inka and introduces us to one of its greatest living teachers. Ancient prophecy is realized in our time as the wisdom of the Inca returns to the world. Psychotherapist and author (The Return of the Inka) Jenkins explains basic beliefs and practices of the Inka and introduces us to one of its greatest living teachers, Don Manuel Q'espi. She describes the realms of living energy that form the basis of Inka evolutionary practice, individual and collective, and leads a guided meditation to experience the transformative nature of this work. • Lonely Planet, publishers. Quechua Phrasebook. 1989. By Ronald Wright, this is part of the "Language Survival Kit" books published by Lonely Planet. Pocket-sized, it's a very handy addition to the Andean treker's backpack. • Longhena, Maria, and Walter Alva. The Inkas and Other Ancient Andean Civilizations. (NY: Barnes & Noble) 1999. A magnificent book that covers the history of the Andean civilizations that rose and fell between 3000 BC and 1533 AD, when the Inkan empire fell. Filled with absolutely stunning color photographs of many golden artifacts, such as necklaces, beads, headdresses, masks, pectorals; and of most of the ancient ruins. A 'must-have' book for those interested in Andean cultures. • Marks, Copeland, The Exotic Kitchens of Peru: The Land of the Inca.. (New York: M. Evans & Co.) 1999. With a glossary of terms and foodstuffs, and interesting backgrounds supplied for most of the recipes, this is a very user-friendly cookbook for those wanting to try their hand at some fairly authentic Andean cuisine. The recipes reflect the blending of Incan and Spanish heritages. No photos; instead the chapter headings are illustrated with drawings made in the 1600s by a Peruvian prince. This beautiful book was published in conjunction with the Fine Arts Museum of San Francisco. Superb color photos illustrate each fabric, clearly showing many details of the patterns , weavings and constructions. An introductory chapter: Weaving in a High land: a Continuous Tradition, gives a thorough explanation of the Andean tradition of spinning, dyeing and weaving, with subsections on the various styles and methods of each region. Another chapter explores the contemporary continuation of this ancient tradition. Chaski explores "little known aspects of the astronomical and magical practices of some ancient and Inkan cultures." Scott Petersen says in the Prologue: "One of the most intriguing aspects of Jame's thesis is that the doors to...new dimensions of awareness are recently opening for us, due to the beginning of a new Pachakuti, or cosmic cycle." This new Pachakuti is said to have begun in 1992. Chaski takes the reader on an expedition through the various ruins, a route similar to the one he feels that former initiates to the Andean Path trod. Wonderful photographs issustrate the various sites and altars during the solstices and equinoxes, so the reader can see exactly how the archetectural features were constructed to display and measure the sun's changing path. Today's ruins are the remains of temples for worship and where astronomical calculations were conducted by the shaman/priests of bygone eras. He has discovered that "the ancient wisdom of the Andes still lives in the stones, and each archaeological monument is a testimony to a magnificent past. We are now in an accelerating new cycle of illumination and discovery. The beginning of the Tenth Pachakuti...was marked by the awakening of this new consciousness. The Amautas will once again make their voices heard. With slow and graceful communication, Wiracocha and Pachamama will lead those who are receptive in this new era of unity." Chaski also apparently is a friend of Edgar Elorrieta Salazar (see the book by him and Fernando Salazar below). This is a book you don't want to miss! • Morrison, Tony. Qosqo: the Navel of the World. (Lima: Spanish Book Services) 1997. Published in English and accompanied by 100 gorgeous color photographs of Cuzco and environs, this is Morrison's attempted reconstruction of the history of the 'Navel of the World,' the ancient Inkan capital and a modern bustling tourist city. I bought this book on the train ride from Machu Pikchu to Cuzco. This volume is one in a series by Condor Books, called "Landmarks in Peru." • Moseley, Michael E. The Incas and Their Ancestors: the Archaeology of Peru. (London: Thames and Hudson) 1992. Quoted from the back cover: "...major new synthesis takes us from the first settlement over 10,000 years ago to the Spanish conquest. Drawing on the intensive research of the last two decades, he shows that Andean prehistory can be understood only in terms of adaptations to extraordinary environmental extremes, from the narrow coastal desert to the harsh highlands. Copious illustrations display throughout the artistic sophistication and technological expertise of the ancient Peruvians, from portrait jars and magnificent textiles to exquisite metalwork and giant pyramids as ancient as those in Egypt." I love to browse through this wonderful work, but it's too scholarly for me to sit down and read from cover to cover. • Myerson, Julia. 'Tambo: Life in an Andean Village. (Austin: Univ. of Texas Press) 1990. North American Myerson and her anthropologist husband, Gary Urton (see below), lived with a family in a village high in the Andes for a whole year. Her story is of the personal lives of these people she came to know and love, their joys and their sorrows, their language and perspective. This book is similar in feeling to Glass-Coffin's chapters of her personal quest among the curanderas. • Narby, Jeremy. The Cosmic Serpent: DNA and the Origins of Knowledge. (NY: Jeremy Tarcher/Putnam) 1998. Relating his experiences in the Peruvian Amazon jungles of working with shamans, Narby combines anthropology, ethnobotany and modern research in DNA with his personal experiences in trying to find a correlation between what modern science knows and how the jungle shamans obtain their knowledge of healing plants. This reads like an adventure-detective story, rather than a dry scholarly account, so Narby's conclusions are readily accessible to the layperson. • Noble, Judith, and Jaime Lacasa, Introduction to Quechua: Language of the Andes. (Chicago: Passport Books) 1999. Book and cassette tape. "This book provides speakers of English with a basic working knowledge of Quechua... The general language of the former Inca Emprie, Quechua is today the most widely spoken indigenous American language. It is used today by over six million people in the Andean region of South America (extending from) southern Colombia, Ecuador, Peru, and Bolivia, and northern Argentina." The tape "contains recordings of all the model sentences in the book, spoken by a native Quechua speaker." Most books on Quechua are for Spanish speakers, so this book is most welcome. • Salazar, Fernando E. Elorrieta, and Edgar Elorrieta Salazar. The Sacred Valley of the Incas: Myths and Symbols. (Cusco, Peru: Sociedad Pacaritanpu Hatha) 1996. From the Forward: "It is through myth that the people expressed their ideal models, and based upon myth, they built the central structure which ruled their social, political and religious organizations....(myth) constituted part of their sacred history." The Andeans used myths to explain their sacred origins, guide their behavior. and legitimize their beliefs and life style to other societies. They also materialized in the form of stone temples and landscaping the bulk of their mythic beliefs. In effect, they built these structures to show how they perceived the cosmos as reflected upon the earth; 'as above, so below.' Photographs of each site are accompanied by drawings that illustrate the various features formed to resemble the pums, condor, and other sacred animals that embodied their spiritual archetypes. The Salazars seem to be friends of James Merejildo (Chaski), whose book is listed above. Another book not to be missed. • Stolze, R.G. "Schizaea pusilla Discovered in Peru." Amer. Fern Journal 77(2):64-65. 1987. A brief account of the discovery in Peru of this strange and rare little fern, formerly thought to be indigenous only to a few isolated sites in eastern North America. See the reference about Peru and New Jersey on page 12. • Sullivan, William. The Secret of the Incas: Myth, Astronomy, and the War Against Time. (NY: Crown Publishers, Inc) 1996. Quoted from the book cover: "Step by step, clue by clue, Sullivan decodes the myths of the Incas to reveal that they embody an astoundingly thorough record of astronomical events - a record so precise that it can be checked against a modern computer program. And he uncovers the Incas' tragic secret: they knew they were doomed." Sullivan's research was massively intense and his story reads like a detective story in spite of the sometimes very technical information. This is not an easy read, but if you persevere, you'll come to understand how the ancient Andeans lived their lives according to what their shaman/priests saw by studying the stars and correlating heavenly happenings with what transpired on the earth below during their many thousands of years of living in this region. This also explains how one of the world's greatest ancient and powerful civilizations came to be easily conquered by a handful of 200-some Spanish soldiers. Please refer to page 17 for a more detailed summary of Sullivan's conclusions. This work 'lost' me! But if you're mathematically inclined, take a stab at it for a different perspective about numbers and mathematics. • Villoldo, Alberto, and Erik Jendresen. Dance of the Four Winds: Secrets of the Inca Medicine Wheel. (Rochester, VT: Destiny Books; originally published by Harper & Row, San Francisco, 1990) 1995. • Villoldo, Alberto, and Erik Jendresen. Island of the Sun: Mastering the Inca Medicine Wheel. (Rochester, VT: Destiny Books; originally published by Harper and Row, San Francisco, 1992) 1995. North American pyschologist Villoldo received his shamanic training in Peru when he journeyed there to study the visionary ceremonies of the native shamans. He met a Professor Antonio Morales Baca who took him to various sites and villages in search of a legendary and very powerful shaman, don Jicaram. At the same time Antonio taught Alberto many concepts. How Villoldo finally found this shaman and his subsequent adventures and experiences learning to live his life from a completely different perspective make for an engrossing story. See also the link on page 15 to The Four Winds Society. • Villoldo, Alberto. "Q'ollorit'i Article Christianizes Q'ero." (Letter to editor) Shaman's Drum 41, spring, 1996. • von Hagen, Adriana, and Craig Morris.The Cities of the Ancient Andes. (London: Thames and Hudson) 1998. This scholarly work traces "the oscillation of cultural leadership between desert and highlands, (showing)...how village settlements gave way to religious centers, how these developed into cities, and how city states became empires. Vignettes of the lives of individuals...vividly bring to life the archaeological narrative and help convey the importance of ceremony in Andean life." (Quoted from the book's jacket.) Many black and white and colored photos plus drawings and diagrams greatly enhance this interesting work. Westerman's text reads like an adventure novel, as he explains a series of personal experiences that led to his interest and exploration of certain sectors of the ruins at Machu Picchu. He and an archaeological team discovered a series of caves under the complex, complete with some stunning artifacts. From these discoveries, Westerman developed his theory as to why the ancient Andeans chose that particular site upon which to build this city of temples. Excellent photographs and drawings illustrate the text. A very valuable book for those interested in Machu Picchu. Wilcox took the Hatun Karpay initiation with Juan Nuñez del Prado in 1997. Before then she had visited and studied with various Q'ero shamans and healers, and also had traveled with Elizabeth Jenkins. (see their magazine article listed below) She has tried to present a comprehensive and factual treatise on the spirituality and cosmology of the Q'ero, who live in several villages in the high Andes and claim to be the direct descendents of the Inkas. An excellent source of knowledge for those interested in Andean mysticism. To be published in December, 2003! Look for it in your favorite bookstore. • Wilcox, Joan, and Elizabeth B. Jenkins. "Journey to Q'ollorit'i: Initiation into Andean Mysticism." Shaman's Drum 40, winter, 1996. • Wilcox, Joan, and Elizabeth B. Jenkins in "Letters - Authors Response" (to Villoldo's letter in same issue). Shaman's Drum 41, spring, 1996. Abstract: "Machu Picchu: A Civil Engineering Marvel takes readers inside the Lost City of the Incas for a groundbreaking perspective never before seen by tourists or archeologists. Built high in the Andes on a seemingly impossible site, Machu Picchu stands as a testament to Early Native Americans and their ability to plan and build. How was it possible to create a mountain-top city complete with running water, drainage systems, food production, and stone structures so advanced they have endured for over 500 years? Authors Kenneth R. Wright and Alfredo Valencia Zegarra explain these and other mysteries, based on their original engineering and scientific research. A fascinating book, Machu Picchu: A Civil Engineering Marvel is a must-have for civil engineers, archeologists, armchair travelers, and tourists alike. An illustrated walking guide and detailed map allow readers to become familiar with each building and pathway, and numerous photographs take readers on a breathtaking pictorial adventure." "A bound-in, fold-out color archaeological map of Machu Picchu keyed to the book's chapters and an array of black-and-white as well as color photographs will help users find and navigate the site easily. This guidebook will help you see things of significance that otherwise might just blend in with the overall grand impressions of this magical place. The authors offer an almost step-by-step tour, constantly guiding the traveler to understand key elements of the function and construction of these remarkably well-designed, well-built, and well-preserved ruins. More than 150 illustrations, many of them in full color.